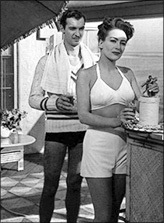 Issue 25 of the NOIR CITY e-magazine, released November 20, may be the FNF's most eclectic and wide-ranging issue yet with its focus on International Noir. Our motto, "It's a Bitter Little World" takes on even more significance when you realize noir is not a specifically American phenomenon. 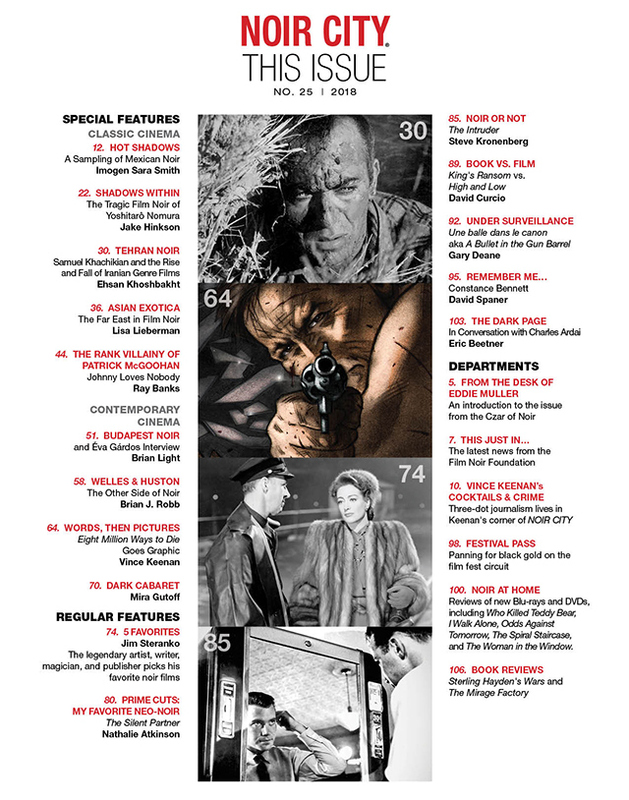 As several of the features in the new issue attest, the noir ethos found expression in cinemas around the world—either contemporaneous with the artistic movement in Hollywood, or inspired by it during the years following. 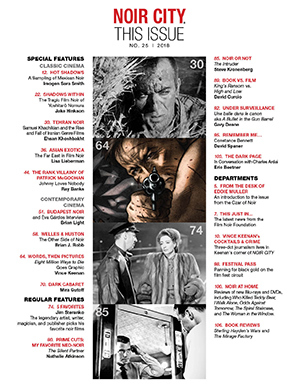 As examples: our cover story, by the always insightful and eloquent Imogen Sara Smith, offers an overview of Mexican Noir; Jake Hinkson offers a terrific introduction to the films of Japanese auteur Yoshitaro Nomura; Brian Light reviews Budapest Noir and interviews the film's director Éva Gárdos; Ray Banks provides an insightful profile of actor Patrick McGoohan. 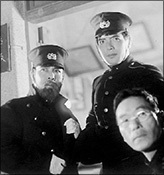 We're also proud to introduce two new contributors in this issue: Ehsan Khoshbakht, co-director of the annual Il Cinema Ritrovato festival in Bologna, offers a fascinating look at the career of Iranian director Samuel Khachikian, and Lisa Lieberman provides an intriguing exploration of how Hollywood exploited "Asian exotica," specifically in film noir. More than 100 sensational pages, including the usual stellar array of theatrical, Blu-ray/DVD and books reviews, plus an outstanding essay by Steve Kronenberg on Roger Corman's The Intruder, and the "5 Favorites" contribution by the legendary comic book writer/artist Jim Steranko. NOIR CITY Issue 25 will really broaden your dark horizons. 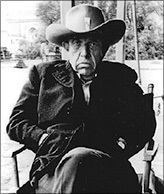 » Making a donation to the Film Noir Foundation of $20 or more. *If your PayPal email address differs from the email address provided for our mailing list, be sure to let us know. Note that you must be on the mailing list in order to receive the e-mag. 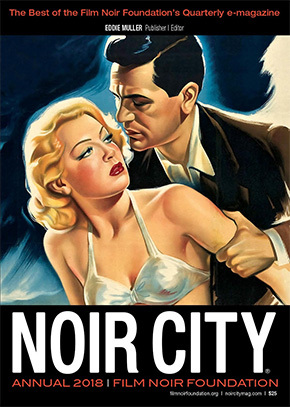 Have an idea for a NOIR CITY E-Mag article? Please send a query letter stating your idea for an article along with a résumé of your writing experience/expertise to: editor@FilmNoirFoundation.org. 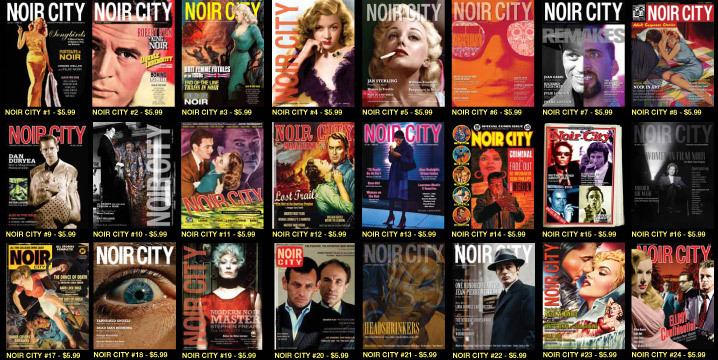 The Film Noir Foundation has its NOIR CITY e-Magazine back issues for sale — all issues, $5.99 each, plus tax. Please note: These are not printed magazines. 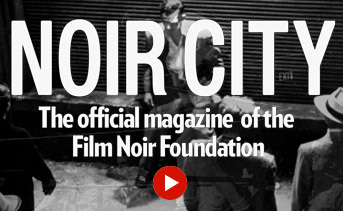 The NOIR CITY e-Magazines are electronic issues delivered to your inbox as PDFs. Collect your favorites or own all 24 interactive back issues of the best cinema publication available today. 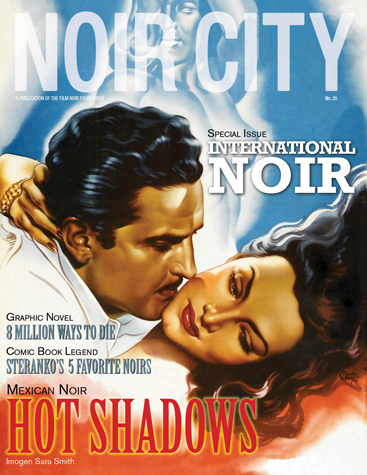 You'll be helping the Film Noir Foundation in its restoration efforts with your purchases at NoirCityMag.com. Surround yourself in a miasma of social media darkness: join us on Facebook, Tumblr and Twitter for a complete immersion in the world of film noir through film stills, posters, film clips, brilliant insights and more.